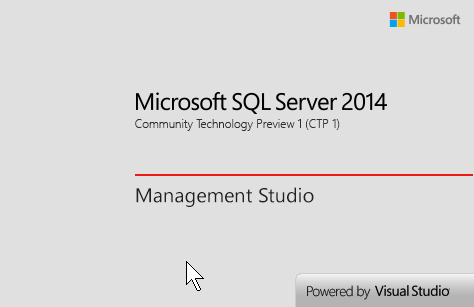 Last month I posted the availability of the first Community Test Preview (CTP-1) of SQL Server 2014, [link]. As mentioned officially by Microsoft this preview (CTP-1) should be installed on a fresh OS (Windows 8 or Server 2012) and not with existing Dev machine. So, some days back I finally managed to get an isolated machine and installed on it. The Installation is similar to SQL Server 2012, only difference is the version number till now. 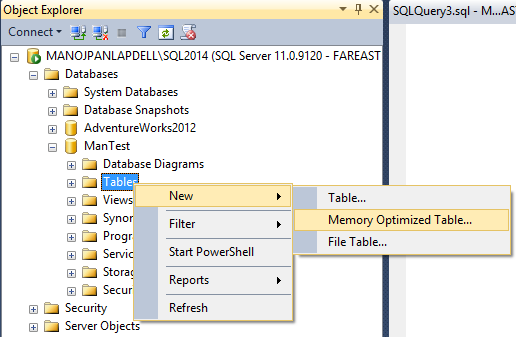 … but this is not graphical (like Create Table), it provides a Script template and opens it in SQL Query Editor. 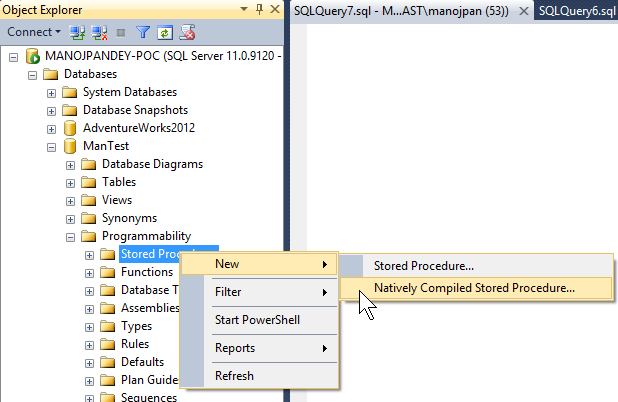 … and just like “Create Procedure” it also provides a Script template and opens it in SQL Query Editor. Next post I’ll come with some hands-on with Creating a Database, Memory Optimized tables and new things introduced in SQL Server 2014. Nice one Manoj – You being lucky to find a separate Dev machine – Any chances of installing it in a machine that has SQL 2012 ?? Does it give any upgrade option ?? Thanks for your comments Saurabh!!! No, SQL Server 2014 should be a clean install, no upgrade from previous versions. And as mentioned in my previous post, the machine should have new OS installed without any previous version of SQL Server, related softwares and no Visual Studio installed, it won’t install otherwise.